Japanese cuisine, "yakibuta", also known as Chinese "char siu", is a slowly cooked juicy pork that goes well with ramen noodles or white rice. The word yakibuta and char-siu are literally translated as "barbecued pork", but the process of making it is not a typical barbecuing. It takes an hour and half to two hours to prepare, but it's not much work, and it is definitely worth. Note: This recipe follows a braising method. Yakibuta's "yaki" or char siu's siu means to roast in this context, so this recipe probably should not be called yakibuta or char siu strictly speaking. 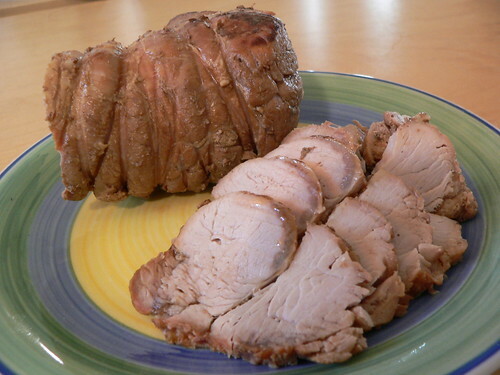 I found a roasting style recipe on Just Bento blog. So read that, too. The recipe in the below is easier but still tasty version. Usually, you can get the exotic materials in any Asian market in US. 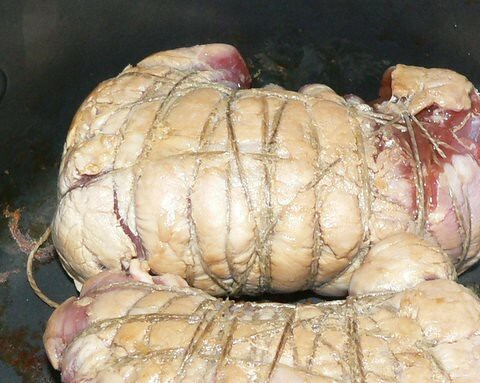 Tie the pork like ham. This will prevent pork from crumbling while it is cooked. In a bowl, mix Ingredient 2-5. Adjust the amount of each ingredient as you taste. Don't make it too salty by putting too much soy sauce. Keep it as little as you just notice its flavor. In the same way, don't put too much mirin or sugar. If you put too much of those, use Ingredient 3 or water to weaken the taste. Put Ingredient 6-10 into a ziploc bag. Then put (1) in the ziploc bag. Carefully pour (2) into the ziploc bag. 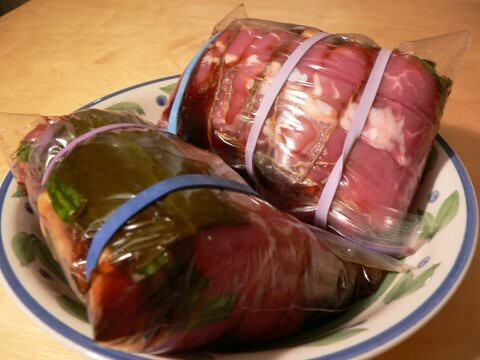 Make sure (1) soaks (2) well, and keep it in the refrigerator for 1 hour (see picture below). Add water in the pan. Only the bottom half of the pork should be under the water. Then pour the soup from (3) into pan. Only the soup should be poured, and no other ingredients should be in the pan. Heat the pan with strong flame until it comes to boil. If you see harshness on the surface, remove it with spoon. Slice the pork to serve. You can keep the pork in the refrigerator for at least a week or longer. You can freeze it for longer preservation. 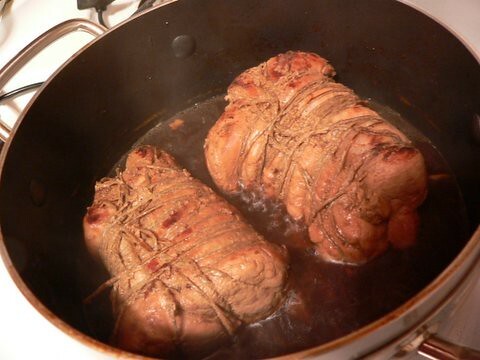 Keep the sauce from (7) with pork so you can use to taste the pork. Or, it makes a great base for soup.